TOM PLATZ - the one and only. In his most revealing seminar and interview he speaks out on drugs, competition, training and success. In this seminar, recorded live in Auckland, New Zealand on Sunday 16th February, 1986, Tom answers numerous questions put to him from a very enthusiastic audience. It is an action packed, most professional seminar and posing display for your instruction and entertainment. The seminar is offered in 2 parts - with Tom posing in both. Part 1 opens with his posing encore and Part 2 closes with his full posing routine and encore. The guidance and motivation from this seminar, is a strong inspiration towards your achieving success. 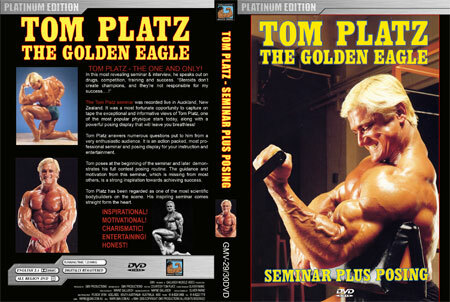 This is our first Tom Platz seminar DVD. The photo below right was taken by Wayne Gallasch at his Adelaide Seminar, not long after this seminar was recorded in NZ. Click here for the DVD REVIEW by Matt Canning. For more on Tom Platz see GMV-195DVD, Tom Platz U.K. Seminar click here. Please click here for the TOM PLATZ PHOTO GALLERY.